MainAll NewsInside IsraelWill 11th hour court ruling block deportation of infiltrators? Will 11th hour court ruling block deportation of infiltrators? Court delivers precedent-setting verdict ordering government to grant infiltrator refugee status, review cases of thousands of infiltrators. Any Israeli appeals court issued a precedent-setting ruling Thursday, potentially blocking the deportation of thousands of illegal immigrants residing in Israel. The court, headed by Judge Elad Azar, ruled that an illegal immigrant from Eritrea who had been denied an asylum request by the Interior Ministry’s Population and Immigration Authority. Thousands of illegal immigrants from Eritrea have cited their country’s draft law as a basis for refugee status. But the Interior Ministry has denied the claim that draft dodgers are ipso facto eligible for asylum, and has summarily dismissed requests for asylum based solely on evasion of the draft. Judge Azar ordered the Interior Ministry to grant the illegal immigrant asylum within 45 days. The ruling could have serious repercussions for the planned deportation of thousands of other illegal immigrants in Israel. Earlier this month, the Interior Ministry notified some 20,000 illegal immigrants that they could face deportation by the end of March if they do not avail themselves of a voluntary self-deportation policy. 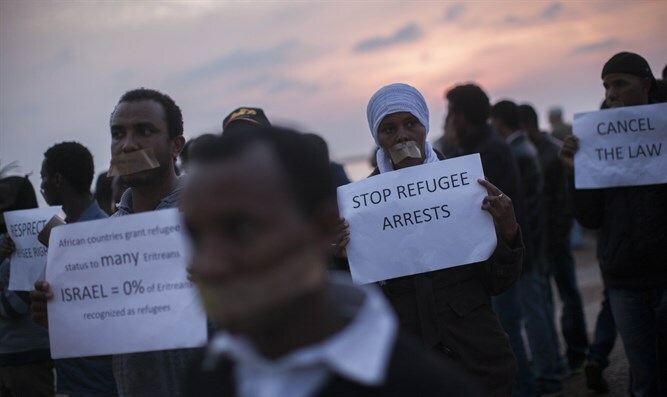 More than 60,000 illegal immigrants from Eritrea, Sudan, and Somalia, referred to colloquially as “infiltrators”, crossed over into Israel from the Sinai Peninsula from 2006 to 2013, prior to the completion of the border fence along the Israel-Egypt frontier. While 15,000 illegal immigrants self-deportation programs offering cash payments of $3,500, it is estimated that close to 38,000 of the original infiltrators remain in Israel – not including children born since their parents’ arrival. A subsequent program which included force deportation for those who refused to leave the country voluntarily in exchange for a cash payment was blocked by the Supreme Court in August 2017. The court cited Israel’s agreements with African countries which had agreed to accept self-deportees, noting that the deals were limited to those who were voluntarily leaving the country. In December, however, the Knesset approved a new program, backed by the Netanyahu government, which would pave the way for forced deportations beginning in April 2018. Relying on a new set of agreements signed between Israel and African countries which will receive deported infiltrators in exchange for compensation from Israel, the program aims to remove the remaining approximately 40,000 illegal immigrants still in Israel. Set to begin on April 1st, the deportation program would remove up to 20,000 recalcitrant infiltrators who refused to accept offers to immigrate to third countries in exchange for cash payments of $3,500. Women, children, and illegal immigrants who have filed for asylum but have yet to receive a formal ruling on their claims will not be removed during the first stage of deportations. Last year, Israel began the deportation of thousands of illegal immigrants from Ukraine. Like the infiltrators from Sudan, Eritrea, and Somalia, thousands of Ukrainian illegal immigrants have filed for refugee status in a bid to block their deportation and claim state benefits. Now, however, following the court’s ruling, more than 8,000 illegal immigrants from Eritrea may be able to appeal their deportation orders. In his decision, Judge Azar explicitly suggested that the ruling could impact most of the Eritrean nationals facing deportation. "It may be assumed that this verdict will carry implications for asylum requests by other Eritreans, the vast majority of which have been rejected under the claim that defection 'did not stem from a political stance of objecting to the regime' on the part of the asylum seeker, and is therefore not a cause recognized by the refugee convention." The Interior Ministry did not respond immediately following the ruling as whether it would alter the planned deportations slated for April, saying that it would have to evaluate the legal implications of the decision.